The Casper Wave is luxurious as it is ergonomic---and yes, it's a foam mattress. While the price point may be higher than we'd like, there's a lot to love here. Whenever there’s a conversation going on about exciting and new mattress brands, bringing up Casper is unavoidable—but it should be pointed out that they’re longer that new. The popular New York-based company has already spent half a decade in the mattress game, and they show no signs of stalling. In fact, on top of several redesigns to improve their flagship mattress, Casper has also recently added two different mattress models to their product line: the very affordable Casper Essential and the deluxe Casper Wave. In this review, we’re going explore what sets the Casper Wave apart from its brand siblings. Why is the Casper Wave more expensive than the flagship Casper or the Casper Essential? How does the Casper Wave actually perform, and does it deliver on its promise of balancing supreme support with cozy comfort? What’s the catch, if any? Read on to find out. Compared to the other Casper mattresses, the Casper Wave is the most expensive; but it’s also the heftiest, most plush, and most innovative design-wise. At 11.5 inches, it’s above industry average in terms of thickness; and with a Casper Wave queen-sized mattress at 109 pounds, it’s heavy and substantial without being very hard to transport and move around. The five different CertiPUR-US approved foam layers within the Casper Wave—and how they’re put together and encased in a fire sock, then a cozy removable cover—show leaps in not only sleep comfort, but also ergonomic technology. Curiously, the company’s official website notes that the Casper Wave is endorsed by the American Chiropractic Association, but we’ve found no mention of that endorsement anywhere else. What’s Inside the Casper Wave Mattress? The one-inch top layer is made of a proprietary material called Flo foam. Casper’s R&D team developed Flo foam to provide an luxurious and velvety soft initial feel to the mattress when you first lie down. It’s meant to pull heat away from your body while providing an great deal of pressure relief—in fact, Casper says that “as you settle in, it melts away” in order for sleepers to get the most out of the four other layers below it. To use an analogy: If the Casper Wave were a perfume, Flo foam would be the top note. The one-and-a-half-inch second layer is made of latex foam. We believe that the inclusion of latex foam here is meant to balance out the Flo foam’s feel, so that the first impression of plushness doesn’t end in the feeling of being stuck or having sunk a little too deep into the mattress. This latex foam is breathable, resilient and responsive; which means you’ll sleep cool, and get a little bounce and support underneath that initial velvet-like softness—allowing you to change sleeping positions and get out of bed easier. The one-and-a-half-inch third layer is made of memory foam. We’re starting to get the logic of the Casper Wave mattress design at this point. Memory foam is known to work wonders when it comes to pressure relief, and it’s also a material that allows for a lot of contour—but sometimes it can trap body heat and you end up sleeping hot. The great thing about the placement of this layer is that it’s right in the middle, and underneath two layers that guard against heat retention and excess sinkage, respectively. Due to the way the layers work together, the memory foam in the Casper Wave does not bring any negatives to the table; and it simply amplifies and buttresses the insanely plush, luxurious, pressure relieving feeling that the Flo foam introduces to the sleeper. The one-and-a-half-inch fourth layer is made of high resiliency foam with what Casper calls a “polymer support network” right in the middle part of the mattress. This provides the Casper Wave’s trademarked hyper-targeted support, which—according to the brand’s FAQ—is helped by a “high resiliency gel”. We’re not sure if the gel they’re talking about is part of the foam, polymer support, or both. In any case, this layer acts as a transition area separating the softer foams above from the base support foam. The extra material at the center of the mattress adds more support for your hip area—the heaviest part of the human body—and guards against you creating possible pressure points by sinking too deep into the mattress. This is not simply extreme pressure relief, but ergonomic pressure relief. The five-and-a-half-inch final layer is made of high density poly foam with contour cuts around the sides of the polymer support network found in the fourth layer. These two bottom layers and their respective innovations work together to improve and encourage proper spine alignment. To us, this feels like an R&D level up of the flagship Casper’s trademarked zoned support! Aside from this function, the firm and durable poly foam bottom layer works like any you would find in a mattress: as a foundational and structural support base. The foams are put together, wrapped in Casper’s proprietary, woven silica-based fire sock, and then given an elegant finishing touch: the removable cozy polyester and rayon blend mattress cover that a solid grey with a subtle gradient. Like the flagship Casper and the Casper Essential, the visual design is monochromatic and minimalist; there’s no Casper tag here, as the white logo is on the fabric itself. How Can You Customize Your Casper Wave Mattress Order? The Casper Wave is available in six standard US sizes: twin, twin XL, full, queen, king and California king. As with all Casper mattresses, adding the Casper Wave to your shopping cart on the official website will bring up optional add-ons from Casper’s product line; like a pillow, a duvet, and even bigger items like a box foundation. Do note that there is no option to customize the softness or firmness of the Casper Wave, or for that matter any Casper mattress. The separate Casper mattress models each come with a respective singular comfort level. For the curious: The Casper Wave is the softest mattress in the Casper product line, while the firmest is the flagship Casper. The Casper Essential is hailed as the happy medium. The first consideration is the construction and materials of the Casper Wave. Yes, innovation is important; and for some it may be worth the much higher price tag of this mattress. However, it’s equally important to point out that for all intents and purposes, the Casper Wave counts as a foam mattress. Some people may scoff at the idea of paying for a luxury mattress and getting an all-foam product; because luxury hybrid and innerspring mattresses—some containing natural and organic material equivalents—can be found at a similar or slightly lower price point. Our take? The price does make us a bit wary, but that’s what sleep trials are for. Unless you’re very much against foam mattresses—Which, if you are, why read this far into the review?—the Casper Wave is worth a shot. You never know; it may turn out that your sleeping position and habits are perfectly compatible with the Casper Wave’s design. Another consideration is the size and weight of the Casper Wave. There are no handles on the mattress cover, so while you may appreciate the heft and plushness of the mattress; you may not enjoy moving it around so much. Not that you need to, unless you’re actually transporting it to a new home or perhaps another bedroom in the house. Because of the trademarked hyper-targeted support and deliberate layering of foams, the Casper Wave should never be flipped. However, if you share a bed with someone that’s built a lot differently—if there’s a huge gap between your weight or height and theirs—you should consider rotating the Casper Wave 180 degrees two to four time a year. What Can Be Used with the Casper Wave Mattress? As expected, Casper’s recommendations consist of their own products: the Casper foundation and metal frame, or their adjustable base. 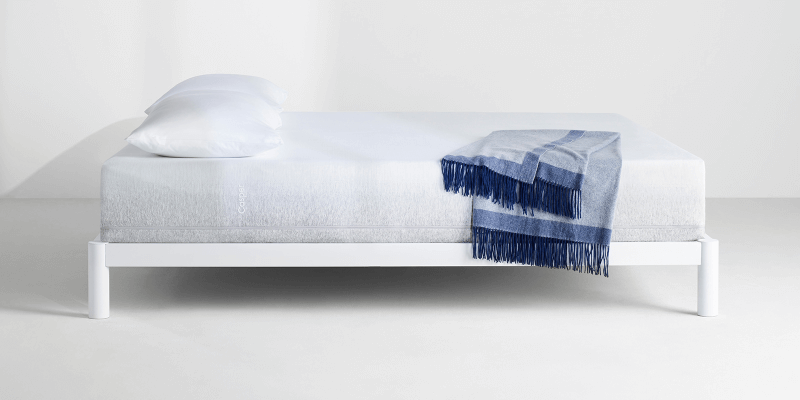 If you do have the budget for it and you’re looking to replace an existing bed anyway, this is a good choice, as using another Casper product with the Casper Wave should guarantee that you’ll be covered by the warranty no matter what. Any bed setup that features direct and firm support will suffice, though—but maybe not the floor. The tendency for moisture and dirt to affect mattresses laid on the floor directly may void the warranty, and besides: Why pay so much for the Casper Wave just to lay it on the ground? How Easy Is It to Set Up the Casper Wave Mattress? This is our favorite part. 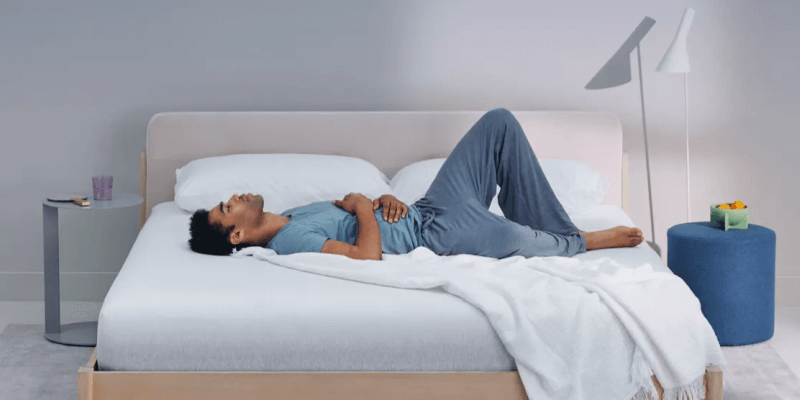 Casper is known as a direct-to-consumer mattress brand, which means that the expectation is that you order the product online and then wait for it to be delivered to your doorstep—after which you’re tasked to haul it inside, then unpack and set it up yourself. Not the Casper Wave! Each Casper Wave purchase comes with complimentary white glove service. All you need to do it order it online, confirm the delivery date, and then sit back and relax when it arrives. The deliverymen will do all the work for you. Casper also offers help with old mattress and box foundation recycling or removal, although there are additional fees for that. There shouldn’t be a strong “new mattress smell”; but should your nose be more sensitive than most, simply keep the area well-ventilated and wait for the scent to dissipate on its own. How do you clean the mattress cover? As with all Casper mattress covers, spot cleaning is the best way. While they’re all easily removable—just a quick unzipping and it’s off—machine washing them may cause them to shrink! Even hand washing should be done carefully, and probably only as a last resort. What’s the Weight Capacity of the Casper Wave Mattress? None, apparently. Casper states that all their mattresses—not just the Casper Wave—-have no weight limit. The Casper Wave is said to be able to support sleepers of “all shapes and sizes”. While we may be a little skeptical when it comes to the thinnest Casper mattress and its ability to support very heavy sleepers—looking at you, Casper Essential—this weight capacity claim is very believable with it comes to the Casper Wave. After all, its innovations actually target weight distribution, and it’s also the thickest Casper mattress. How Does the Casper Wave Mattress Feel? Like the Casper Essential, the Casper Wave is relatively new compared to the flagship Casper; so we do need to check and re-check the customer reviews we come across to make sure that we’re looking at feedback about the Casper Wave specifically. The sparse but nevertheless reoccurring negative comments we’ve seen all seem to focus on the price point and the materials. When it comes to feel, there are some people that shared that they actually developed pressure points that cause discomfort when they first tried out the Casper Wave—only for it to go away the longer they used the mattress. The possible explanation for this is that sleepers sometimes need to unlearn bad habits; you may not be completely aware that you’re doing it, but your default sleeping position may be a way for you to compensate for things you find uncomfortable about your current bed setup. When dealing with a new mattress, the tendency is to go to sleep exactly the same way; and then your body will gradually find its new ideal position over time. Not everyone does this at the same rate. Some adjust in a day; some take weeks or months! In any case, most comments regarding pressure points and pain—apart from the kind we just explained—are actually positive. There are many stories about chronic pains disappearing, and even one anecdote about being so comfortable that they slept through an earthquake. Casper may not be a veteran mattress brand, but they’re not newcomers, either. They know how this works, and understand that brand visibility can only go so far. The Casper Wave in particular is a gamble, because its price point puts it out of reach for many customers that were part of their initial target market. This is not a starter mattress by any means. The complimentary white glove service is likely Casper’s way of providing better value for money to potential Casper Wave owners—and that kind of meeting-you-in-the-middle approach is something we really notice and appreciate. How Is Casper’s Customer Support? Casper is very active on social media, which is par for the course for an online brand. You can check their Facebook, Instagram, or other social media accounts for new product updates or the periodic sale period. If you’re not so internet savvy, there’s also an information-packed FAQ on their official website. Their “snooze specialists” make a pretty good customer support team, too. We love that there’s live chat, and we’ve tested it ourselves and found the responses to be both quick and very helpful; but there’s also an email address for not-so-immediate concerns, and a telephone hotline for people that want to keep it old school. How Easy Are Returns with Casper? How Good Is the Warranty? There is a 10-year limited warranty and a 100-night sleep trial. What does this mean? While the warranty is typical for its kind—you can check it out on their official website—it does cover the usable lifespan of the product. You should be changing mattresses every 10 years, anyway! As for the sleep trial: It’s basically the online mattress store industry’s way of replacing the mattress showrooms that are quickly going the way of the dinosaur. You don’t get to try a dozen mattresses for a few minutes each while you get your ear talked off by a salesman; instead, you pick on mattress—in this case, the Casper Wave—and get 100 days to decide whether you like it enough to keep it. If not, you can return it with no questions asked and receive a full refund. Just make sure that avail of the return policy within the trial period, and Casper will do everything else after you contact their support team to inform them of the mattress return: pickup, as well as arranging for the product to be recycled or donated. How Much Does the Casper Wave Mattress Cost? As of this writing, the queen-sized Casper Wave mattress is available for $1,995. We know. It shocked us a bit, too! However, remember that this includes free shipping if you’re having it delivered somewhere in Canada or the US. Expect it to be delivered within the time period noted upon checkout. Because there’s white glove delivery—which you can opt out of, but why would you?—delivery time can take longer than average or can even be delayed. We saw some negative feedback regarding this, too. Take this into consideration if you’re in need of a mattress in a hurry. The Casper Wave is a foam mattress. We know! It’s not like Casper is trying to hide this fact. Yes, it’s expensive. But setting the price point aside, there are real advantages and benefits to sleeping on the Casper Wave. Warranty and sleep trial period notwithstanding—because, let’s face it, both are as good as industry standard by now—there are real innovations here. We like that Casper is prioritizing their R&D team’s efforts. We like that they’re gambling on a product design that isn’t as easy to sell as their flagship. We love the focus on pressure relief balanced with proper alignment. We don’t like the fact that the mattress cover isn’t built with handles to help you move around the Casper Wave, and we’d love it even more if Casper made machine washable mattress covers in the first place; but barring those, there’s really nothing to complain about except or the price tag. Bottom line: If you’re looking for pressure relief, have a sense of adventure, and don’t mind the price, you might as well try out the Casper Wave. Who knows? It may surprise you.